It’s hard to believe that Afghanistan, a country torn by war and religious extremism, was once a peaceful Buddhist nation. Pilgrims from all over Central and South Asia came to this remote mountainous region, built monasteries and colossal statues, dug caves into the sandstone and meditated. Buddhism was brought to Afghanistan in the first century by the Kushan Empire of the historic region of Bactria in Central Asia. The most famous Kushan Emperor, Kanishka the Great, was a great patron of Buddhism. His conquests and patronage of Buddhism played an important role in the development of the Silk Road, and the spread of Buddhism across the Karakoram range to India, China and other Asian countries. Once Islam bulldozed into Central Asia and this ancient Hindu Kush region of Afghanistan, the religiously intolerant rulers ordered the destruction of all Buddhist sites. Islam becoming the state religion and Buddhism vanished. Decades of war have turned to rubble many important archeological sites and museum collections were either looted or destroyed. The last acts of aggression happened not too long ago, when two monumental statues of Buddha near the town of Bamiyan were blown to bits by the Taliban in 2001. 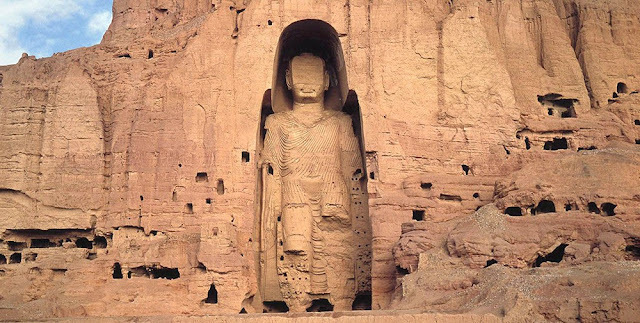 The Bamiyan area was a prominent center of Buddhism. The seventh century Chinese monk Hsuan-Tsang described the town as a flourishing Buddhist center “with more than ten monasteries and more than a thousand monks”. The two Buddha figures stood at 120 feet and 175 feet respectively, and were decorated in “dazzling golden color and adorned with brilliant gems”. Historians believe that the monumental Buddha sculptures were carved into the cliffs between the third to sixth centuries. They were perhaps the most famous cultural landmarks of the region attracting numerous pilgrims from all around. 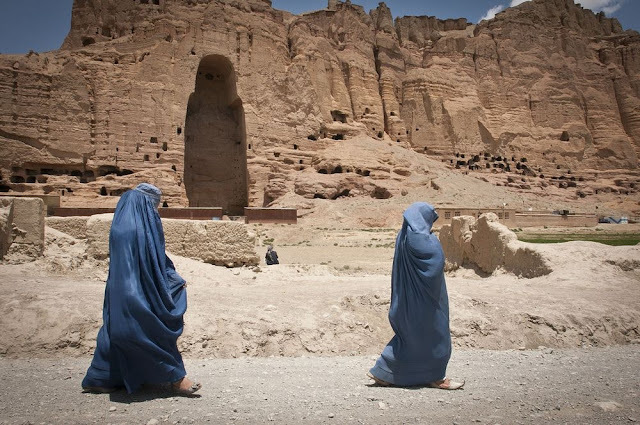 Two women walk past the huge cavity where one of the ancient Buddhas of Bamiyan used to stand. 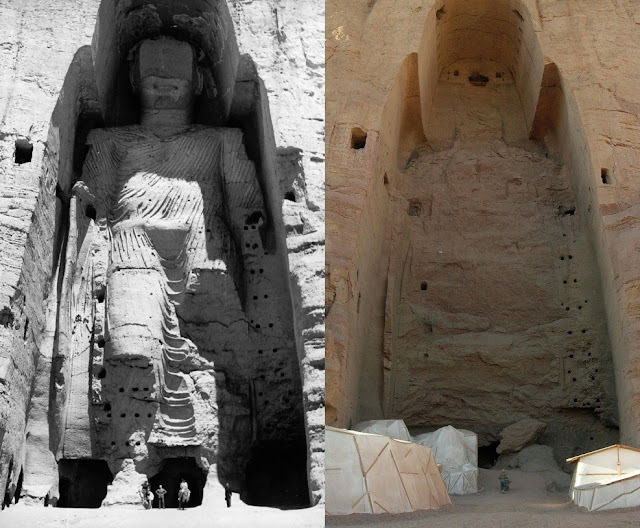 The taller Buddha of Bamiyan before (left picture) and after destruction (right). 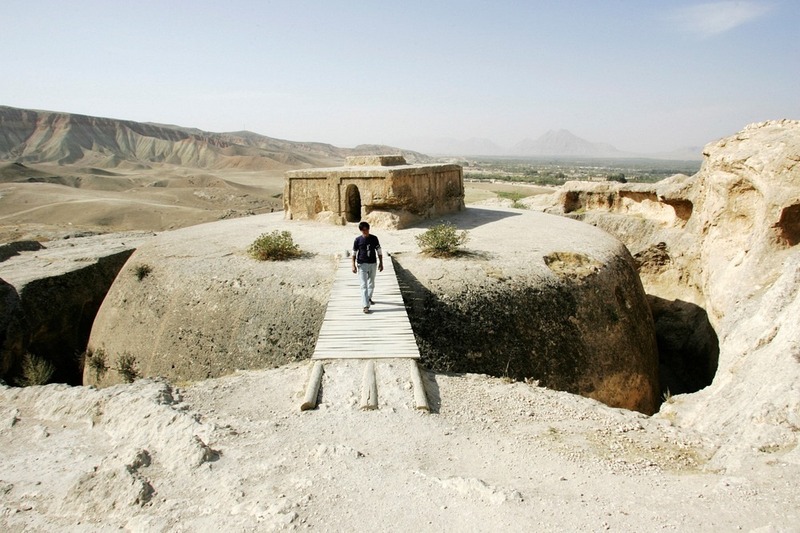 The ancient town of Samangan on the banks of Khulm River was also an important Buddhist center. The town’s Buddhist past can still be seen in the form of a rock-cut cave monastery complex and an adjacent stupa hewn out of the bed rock. 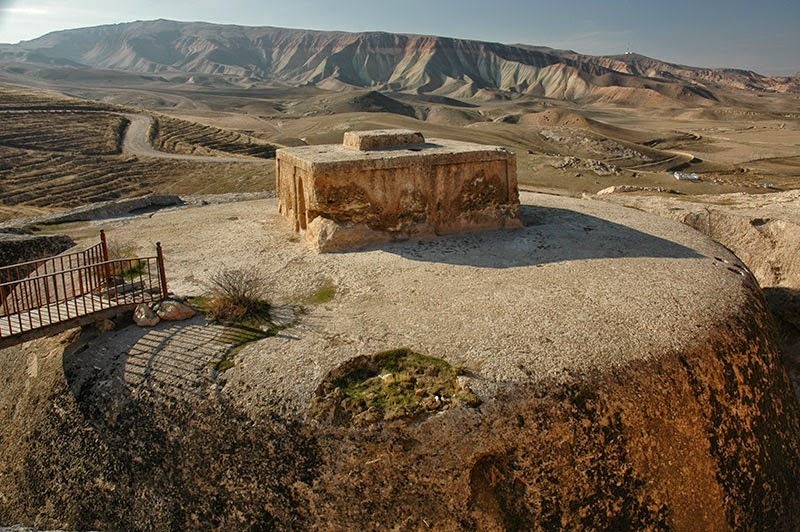 The stupa of Takht-e-Rostam is located about 3 km from Samangan on top of a hill. It was here, legends hold, that the mythical Persian king Rostam married his bride Tamina. Takht-e-Rostam literally means “the throne of Rostam”. The stupa was built during the waning days of the Kushan empire, possibly between the fourth and fifth centuries. The empire was eventually wiped out in fifth century by the invasions of the Hephthalites, the Huns and the rise of the Gupta Empire in the east. Unlike other Buddhist stupas, the one of Takht-e Rostam is not located above ground, but has been carved into the mountain rock, in a style that resembles the monolithic churches of Ethiopia. This may have been done to camouflage the monastery and stupa from invaders, or simply to escape the extreme summer heat. The stupa is mounted by a Harmika and surrounded by a trench, eight meters deep, the inside walls of which contains several caves and monastic cells for meditation. 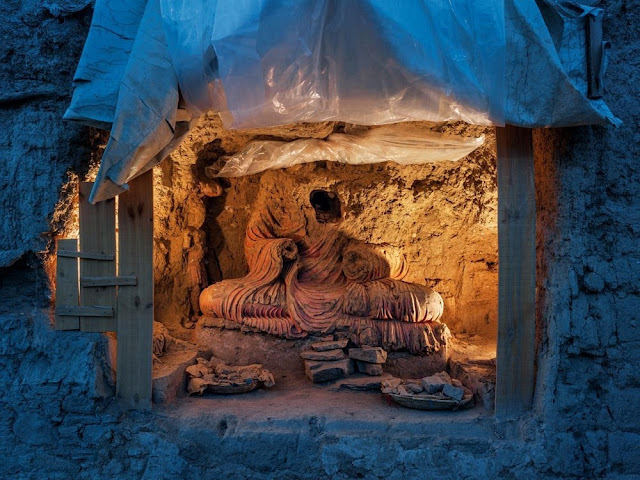 Another historically significant Buddhist site under threat is the ancient settlement of Mes Aynak, about 40 km from Kabul. 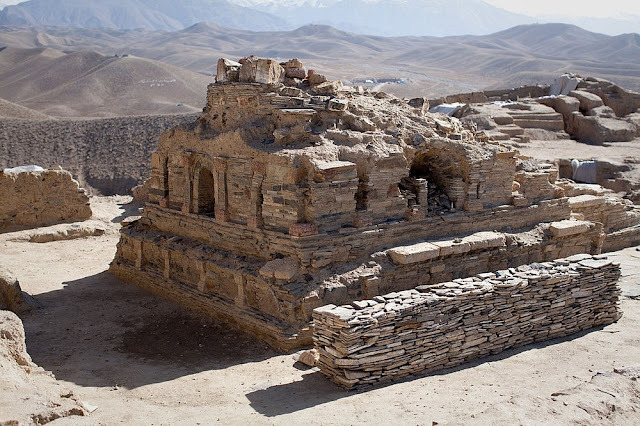 From the third to the eighth centuries, Mes Aynak was a spiritual hub with several multistory Buddhist monastery complexes, containing chapels and other structures protected by high walls and ancient watchtowers. Within these fortified complexes and residences archaeologists have uncovered hundreds of Buddhist statues and clay stupas, and other artifacts including gold jewelry, fragments of ancient manuscripts, and walls adorned with frescoes. This ancient Buddhist settlement sits on top of one of the world’s largest untapped deposits of copper ore. There is evidence that this copper was mined in antiquity. It was copper that made the Buddhist monks here wealthy. A Buddhist stupa excavated at Mes Ainak. Trouble began in 2007 when the Afghanistan government granted a Chinese mining company rights to mine copper in Mes Aynak. The site is estimated to contain some 12.5 million tons of copper worth tens of billions of dollars. Mining is certainly a lucrative prospect that will help the country’s fragile economy, but digging into the ground would destroy the site's archaeological remains. Intervention by the international community have helped stall the plan, while millions of dollars of funding from international bodies is currently being utilized to recover as many artifacts as possible before mining starts. The National Museum of Afghanistan in Kabul has been inundated with artifacts sent from Mes Aynak. Lack of space has forced them to return many except the most important pieces. Omara Khan Massoudi, the director of the museum, hopes that someday they will be able to erect a local museum dedicated to preserving the memory of Mes Aynak.